Did you know that the yucatan caves are one of the most extensive underground drainage systems in the world? Hover your mouse over the image to see the enlarged image. Breathtakingly beautiful, isn't it? 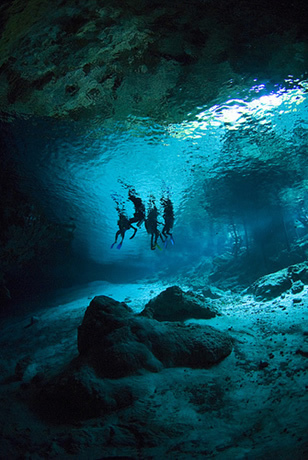 Truly, these caves or cenotes are hidden attractions of unimaginable beauty. Their invisibility contributes to their mystery,and I think it is a good thing that they remain at least partly inaccessible for most humans. There's beautiful colors of green and blue down there where daylight penetrates the blackness, and even more surprising: various forms of life, like a blind little fish called Ogilbia pearsei and various types of shrimp and crustaceans. Cave diving is a hazardous sport which you should never undertake on your own, especially if you have only limited diving experience. I myself have made a couple of 'normal' dives but I wouldn't dream of going into these caves without an absolute expert, like Steve Gerrard. One thing I realized only after starting to investigate cave diving, is that when something happens down there, one of your escape routes (going up!!) is closed, remember there's a ceiling above you. That's enough for me to get claustrophobic! How easy is it to map Yucatan caves? You know the drill... See how cristal clear the water is? As far as I know, a complete map of yucatan caves does not exist, or at least I haven't found it yet. Just imagine getting this done, the time (and money) spent on this! I did found some people who have made this enterprise to map these caves their lives job. The Ox Bel Ha yucatan caves exploration team is a group of people formed in 1999. 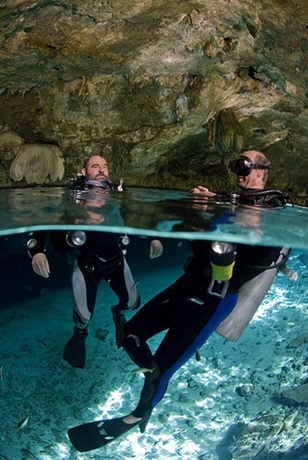 They are committed to the exploration and preservation of these beautiful cave systems containing 44 interconnected cenotes and 3 exits into the Caribbean sea. Their diagram of Yucatan caves is the most extensive I have found so far. Tom Iliffe is a cave biologist from Texas A&M University, who in 2002 explored a series of cenotes denominated the Ring of Cenotes, a 180 km semi-circle of underwater caves. These caves are located on the outer edge of what used to be the 65 million year old meteor crater that caused the extinction of the Dinosaur. On his site, you can find some maps of these specific Yucatan caves with unpronouncable names like Chacsinicchee, Kankirixche and others. As you see there are not too many humans dedicated to map Yucatan caves. Anyway I'll keep my eye out for other maps and point them out to you whenever I find a new one or an update.